Need to haul a 1,300lbs bull moose off the Alaskan tundra? You're going to need an Argo. The world's only eight-wheel-drive, amphibious ATV can literally go anywhere. What're they supposed to do? Where a typical ATV or other wheeled vehicle would get bogged down, an Argo is designed to get you through tough situations while carrying a heavy load. Manufactured in Canada, these tough 8x8 vehicles are made to get you through snow, muskeg, marsh, soggy tundra and even open water. Argos float and are amphibious, but rely on wheel spin both for motivation and steering. They're best employed on calm water in predictable conditions. How're they supposed to do it? Starting around $12,000 and currently available in five different recreational models, an Argo is capable of carrying four people over rough terrain with its eight-wheel-drive and optional rubber tank tracks. Designed as an amphibious vehicle, they can easily cross small creeks and streams. They are capable of open water crossings, however this should only be considered when water conditions are very calm as stability and navigational abilities are minimal at best. Using a differential steering system — one side's wheels are driven faster than the other — maneuvering on water is not easy nor accurate, but that arrangement does come in handy when traversing tricky terrain. Sitting fairly low to the ground, an Argo has fantastic stability, giving you an added amount of confidence on steep hillsides. With its eight-wheel traction and ground clearance — there basically is no breakover, you can't high-center — you don't need to worry about bottoming out or stalling on large objects. Powered by a range of Briggs & Stratton power equipment motors, the Argos aren't fast. Top speed is limited to 19mph and the 627cc motor in this tested unit only develops 23bhp. Heavily utilized in the Arctic, the Scottish Highlands and even the swamps of Louisiana, an Argo is at its best when the terrain is rough and the ground is wet. Argos have stood in for lunar rovers during past simulations and now, the company is even helping NASA develop future wheeled vehicles for space exploration. How do they perform? I've used these vehicles extensively out on the Seward Peninsula of Alaska, where every inch of ground is covered by waterlogged tundra, with large grass tussocks making any journey a tough one. The going on foot is almost impossible, as the tussocks threaten to easily snap an ankle, thus Argos are used to cover the vast distances and haul heavy loads. Argos are not design for comfort, and they're not remotely comfortable. After hours of bouncing up and down over the hills looking for moose and caribou your backside is going to be feeling a little tender. With no real suspension system the axels are a little vulnerable and you're going to need decent seat cushioning. Argos are also one of the few vehicles that can drive through deep, soft snow. Nothing else is this diverse in its capabilities. Quick tip: although they are designed to carry around four people, the guys in the front seats get a much softer ride. But no regular four-wheel ATV would survive out there for long and simply wouldn't have the hauling capacity required to get the job done. With a load capacity of 1,500 pounds and a towing capacity of up to 2,000 pounds an Argo will make light work of big loads. Argos have several optional features that are very handy out in the bush. One feature that is a must up north, or in any rainy climate, is the addition of a hard top. Shelter from the wind, rain and snow is really appreciated when you're driving out in the elements for an extended amount of time. After hours of glassing for animals it feels good to be able to close a door on the elements and warm up a bit. Climbing on top of the roof also offers a better vantage point to take a peek out over the willows, which can be very handy. Particularly when looking for bears. Various militaries around the world have employed Argos as all-terrain utility vehicles. They're much cheaper than your standard HMMWV and capable of accessing even more hostile terrain. Another useful add-on is the winch. These are very helpful when you need to drag heavy objects (such as a moose) out of a difficult locations (they have a knack for dropping in fairly awkward spots) as well as pulling the Argo itself out when stuck in the muck. Although an Argo can pretty much go anywhere, I would highly recommend traveling in pairs when in remote areas in case of breakdown or needing help to tug the other out of tough situations. The optional tank tracks make a world of difference in both how smooth the ride is and the Argo's ability to navigate difficult terrain. Tundra is fairly delicate, but an Argo is light and soft on the ground to begin with, and adding rubber tank tracks distributes the weight even further making it relatively gentle on the fragile terrain. 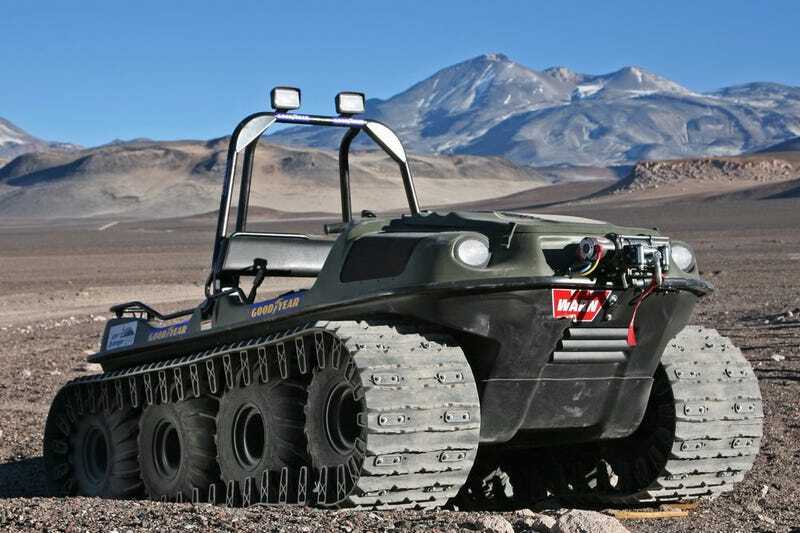 Using just the tires, maximum ground pressure is only 2.1psi; equipped with tank tracks, that drops to .67psi — an Argo literally treads lightly. When negotiating a steep river bank you're really going to appreciate the tracks' ability to grip and carry the Argo up and over to the other side. After dozens of stream crossings I've never gotten wet once. Well, except for the few times pushing it out when it got stuck. The author's "own" Argo lives in a remote Alaskan hunting camp and sports a homemade cab. Even though these vehicles were being used year after year in a remote camp in the middle of the Arctic, they have remarkable longevity. Serviced only once a year at the beginning of the season, they have had many years of chugging along. That isn't to say that they don't have mechanical hiccups every now and then. They do. It certainly helps to have those individuals with the necessary mechanical skills around camp and an extensive tool kit to work with. Adventure ready? Yes, assuming you're willing to go to the place it'll take you. I would recommend an Argo to anyone who needs to access rough, remote areas in a wet climate. These machines are a lifeline in the wilderness and if you don't mind getting your hands a little greasy, can be an outdoorsman's best friend.